It’s another fantastic achievement for brilliant Coxhoe business. Coates Butchers, which works in partnership with Seventeen, narrowly missed out in getting the Butcher’s Shop of the Year Award in London on 7th November. Brother and sister Ivan and Norma Lowther were presented with the Finalist certificate at a lavish celebratory industry reception and lunchtime ceremony. The ceremony saw the best in butchery in independent butchers across the country come together and recognise and rewarded the top butchers in the nation. The annual Butcher’s Shop of the Year awards reward excellence and innovation in butchery in independent butchers, farm shops, food hall providers and on-line outlets across England, Wales, Scotland and Northern Ireland. 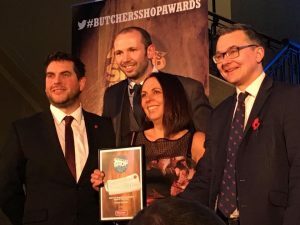 Coates was a finalist in the North of England Butcher’s Shop of the Year category of which there were three businesses selected. Coxhoe is proud of our businesses and its achievements.